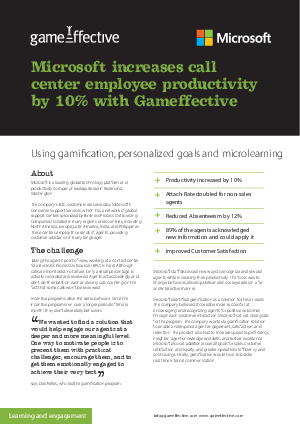 Read this Microsoft case study about how Microsoft's Consumer Support Services - with its global network of support centers and thousands of agents - used digital motivation to drive agent performance and learning. focus was to change behaviors, develop skills, encourage sales, and drive outcomes. Improved agent knowledge and ability to apply the new information learned.